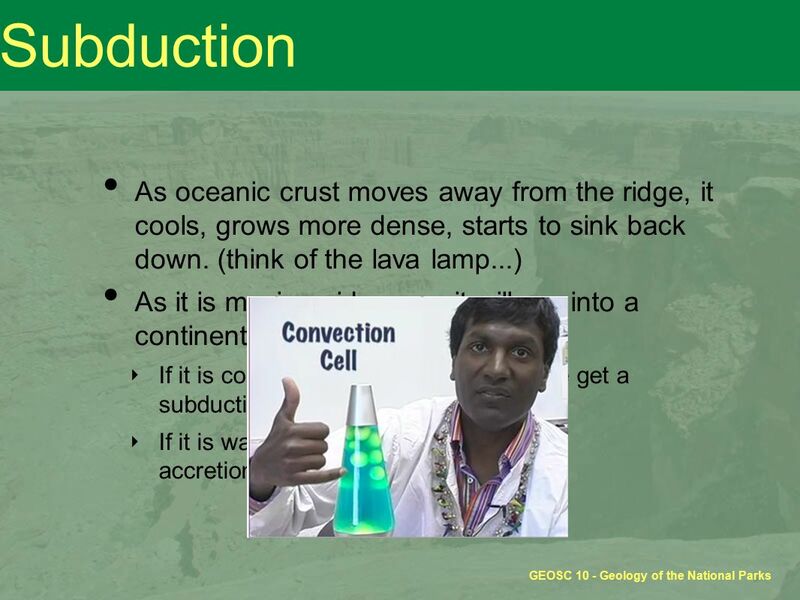 GEOSC 10: Geology of the National Parks Plate Tectonics II: Making Mountains & Volcanism Presented by Dr. Sridhar Anandakrishnan The Pennsylvania State. 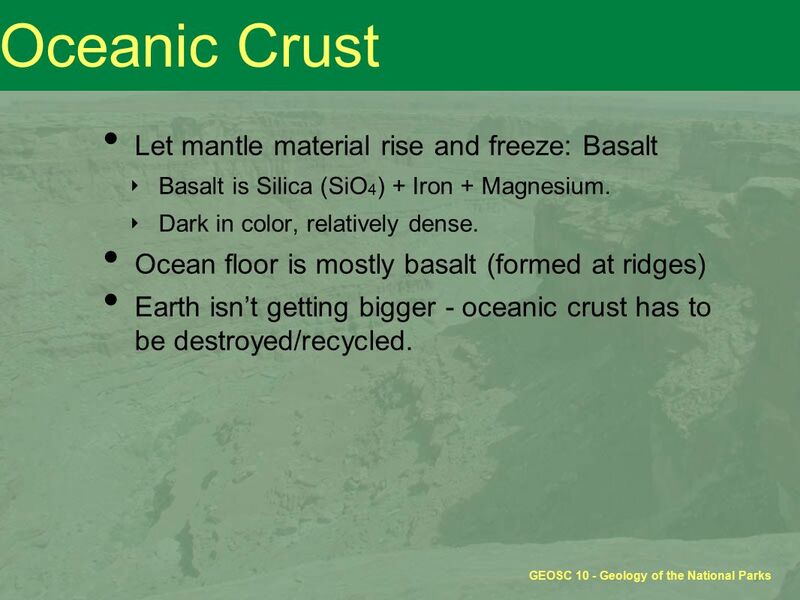 9 GEOSC 10 - Geology of the National Parks Oceanic Crust Let mantle material rise and freeze: Basalt ‣ Basalt is Silica (SiO 4 ) + Iron + Magnesium. ‣ Dark in color, relatively dense. 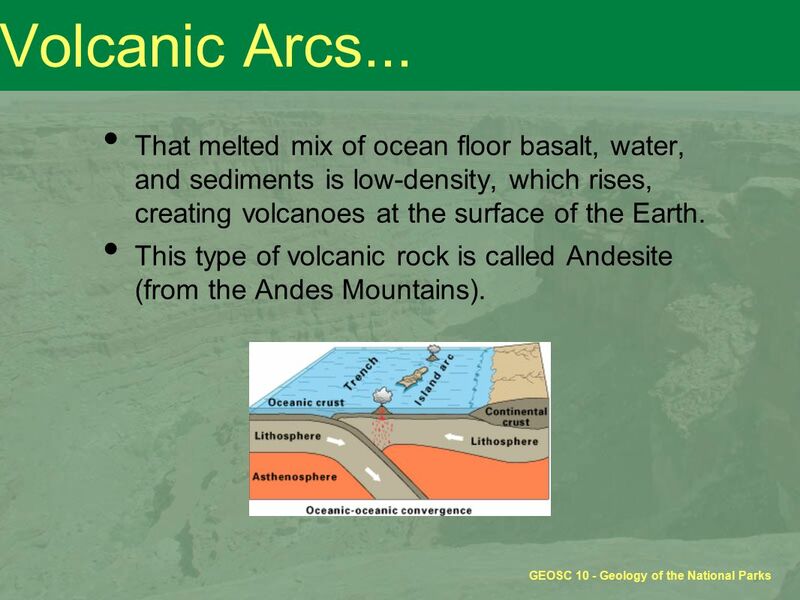 Ocean floor is mostly basalt (formed at ridges) Earth isn’t getting bigger - oceanic crust has to be destroyed/recycled. 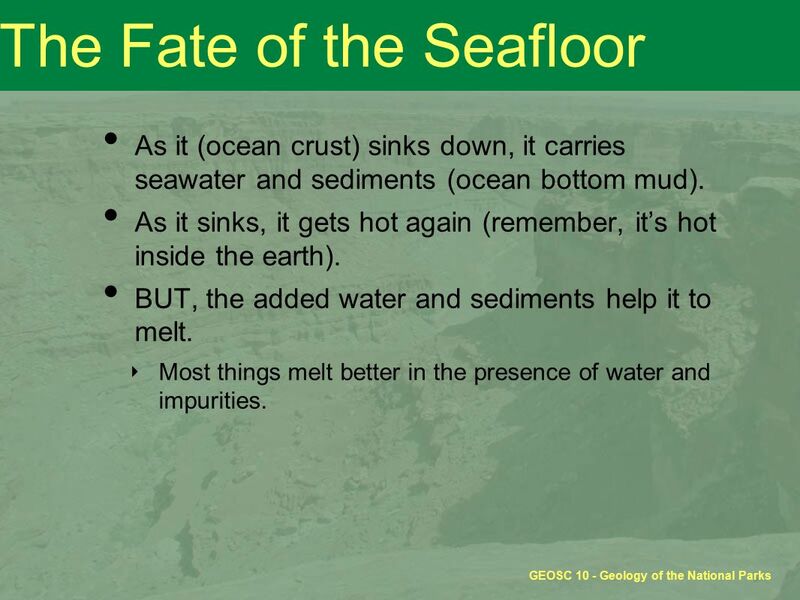 11 GEOSC 10 - Geology of the National Parks The Fate of the Seafloor As it (ocean crust) sinks down, it carries seawater and sediments (ocean bottom mud). As it sinks, it gets hot again (remember, it’s hot inside the earth). BUT, the added water and sediments help it to melt. ‣ Most things melt better in the presence of water and impurities. 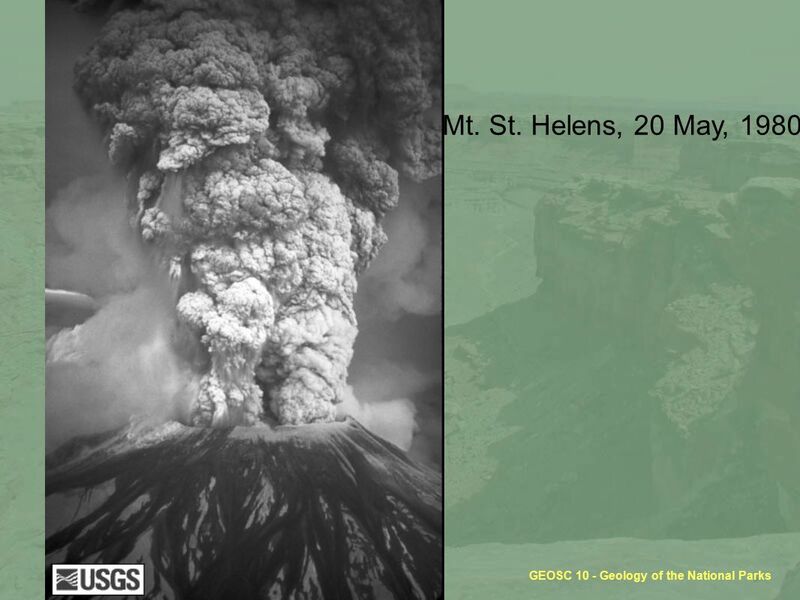 12 GEOSC 10 - Geology of the National Parks Volcanic Arcs... That melted mix of ocean floor basalt, water, and sediments is low-density, which rises, creating volcanoes at the surface of the Earth. This type of volcanic rock is called Andesite (from the Andes Mountains). 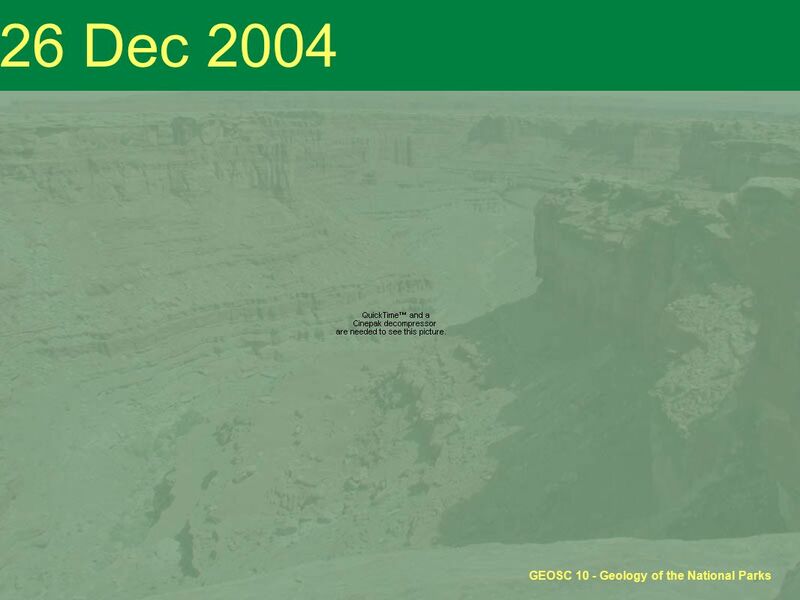 13 GEOSC 10 - Geology of the National Parks Earthquakes... 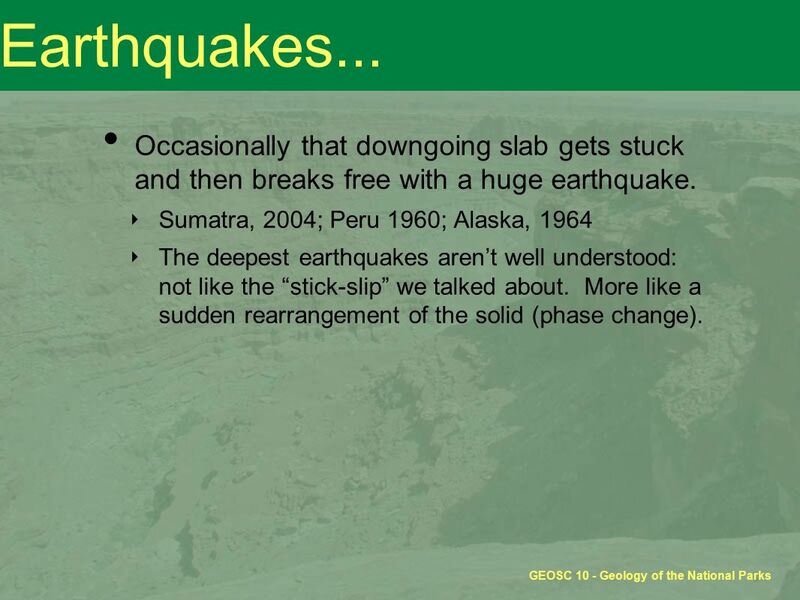 Occasionally that downgoing slab gets stuck and then breaks free with a huge earthquake. ‣ Sumatra, 2004; Peru 1960; Alaska, 1964 ‣ The deepest earthquakes aren’t well understood: not like the “stick-slip” we talked about. More like a sudden rearrangement of the solid (phase change). 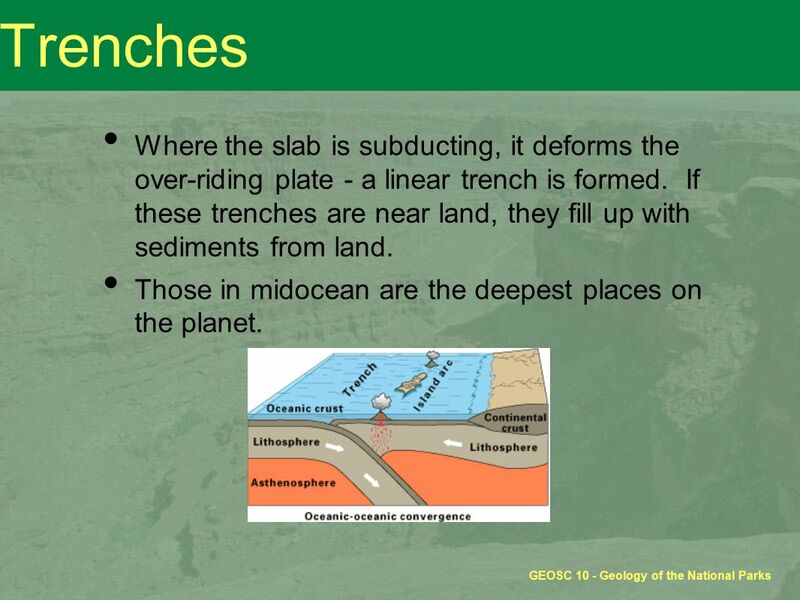 14 GEOSC 10 - Geology of the National Parks Trenches Where the slab is subducting, it deforms the over-riding plate - a linear trench is formed. 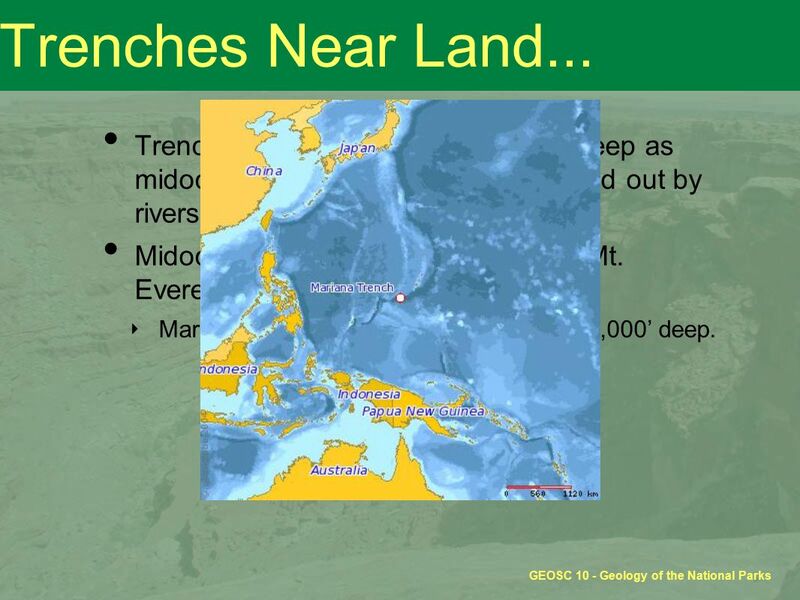 If these trenches are near land, they fill up with sediments from land. Those in midocean are the deepest places on the planet. 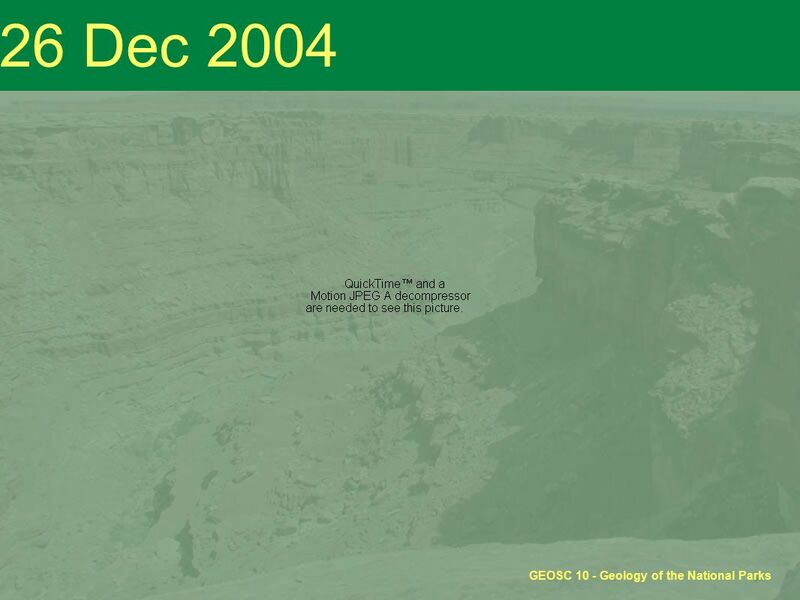 15 GEOSC 10 - Geology of the National Parks Trenches Near Land... Trenches near continents aren’t as deep as midocean trenches. Sediment washed out by rivers fills them up quickly. 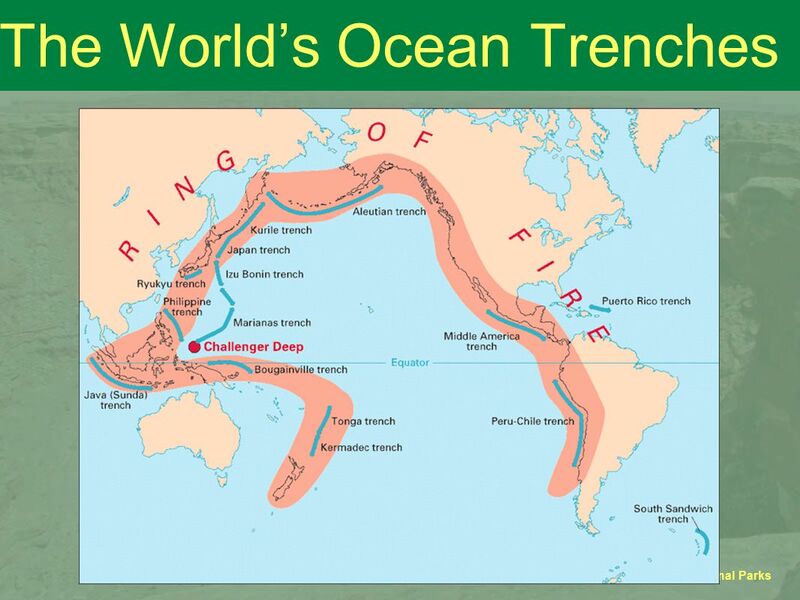 Midocean trenches are deeper than Mt. Everest is high! ‣ Marianas Trench off the Philippines is 35,000’ deep. 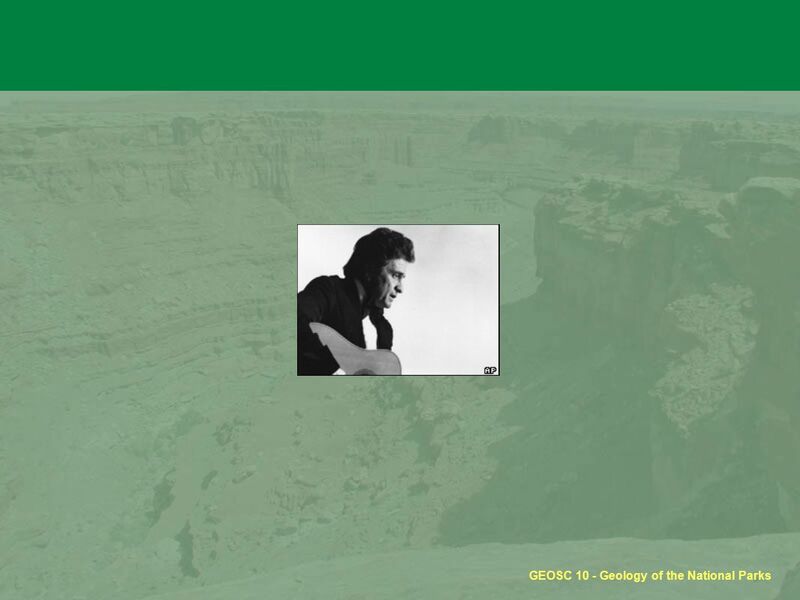 16 GEOSC 10 - Geology of the National Parks First (best!) 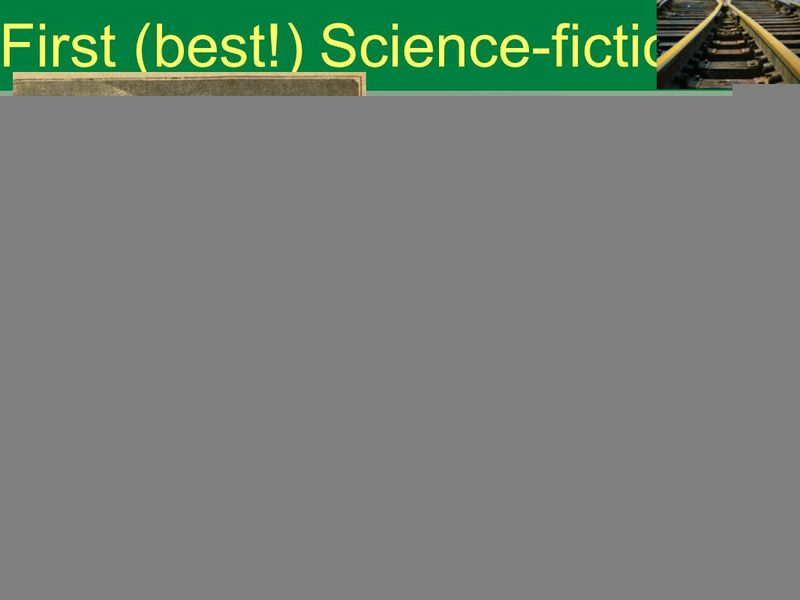 Science-fiction 20,000 Leagues Under the Sea by Jules Verne ‣ The 20,000 leagues (about 60,000 miles) is the length of the trip, not how deep it dives - Verne knew better! 18 Density... 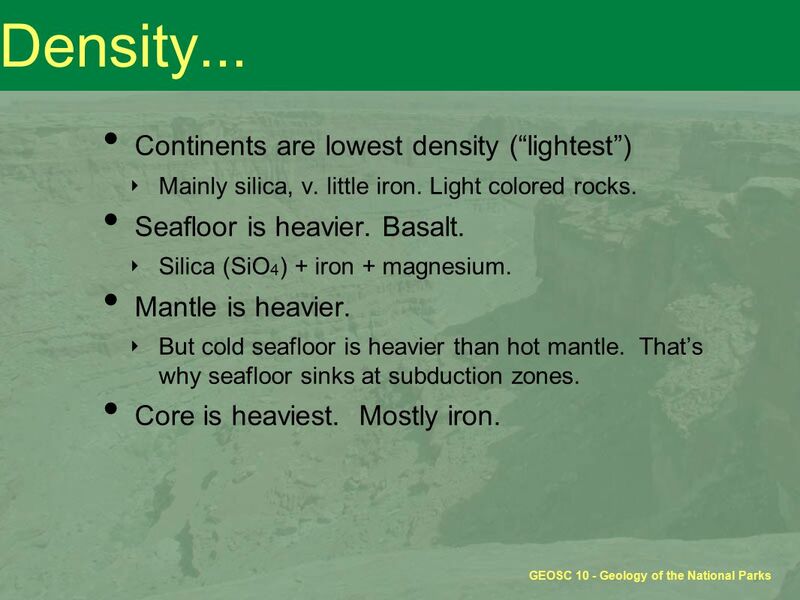 Continents are lowest density (“lightest”) ‣ Mainly silica, v. little iron. Light colored rocks. Seafloor is heavier. Basalt. ‣ Silica (SiO 4 ) + iron + magnesium. Mantle is heavier. ‣ But cold seafloor is heavier than hot mantle. 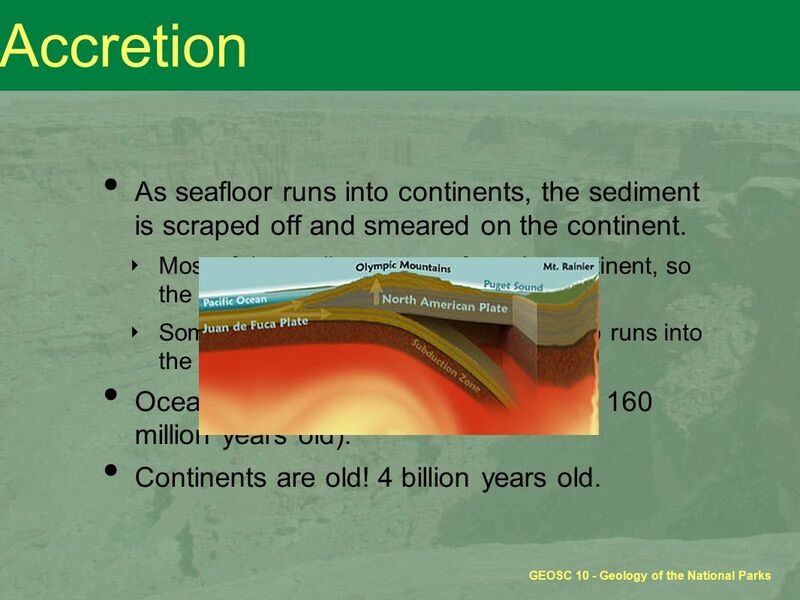 That’s why seafloor sinks at subduction zones. Core is heaviest. Mostly iron. 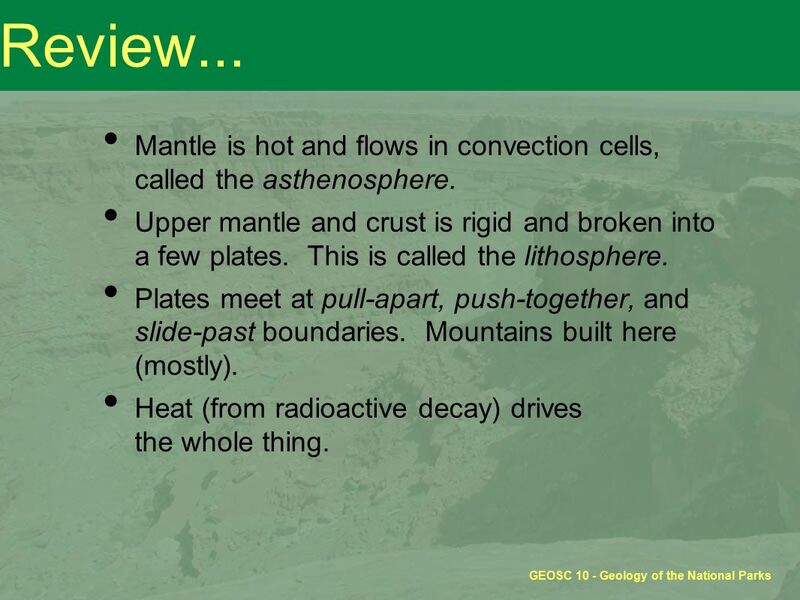 20 GEOSC 10 - Geology of the National Parks Review... Mantle is hot and flows in convection cells, called the asthenosphere. 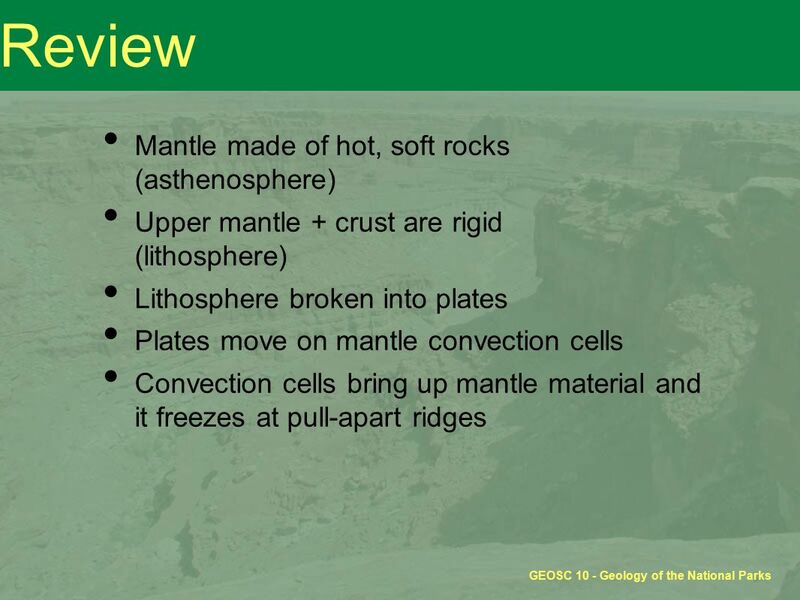 Upper mantle and crust is rigid and broken into a few plates. This is called the lithosphere. Plates meet at pull-apart, push-together, and slide-past boundaries. Mountains built here (mostly). Heat (from radioactive decay) drives the whole thing. 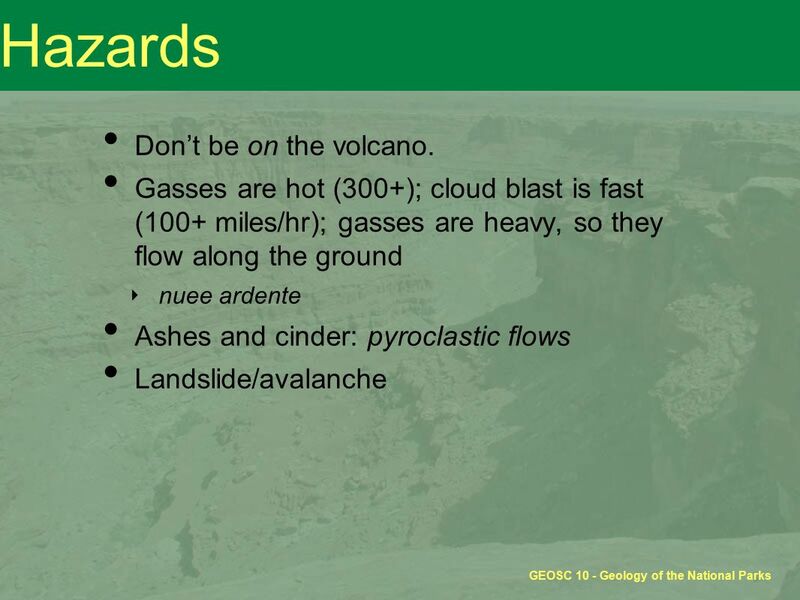 22 Subduction Volcanoes When basalt + water + sediments heat up, they melt and rise, forming andesitic volcanoes. 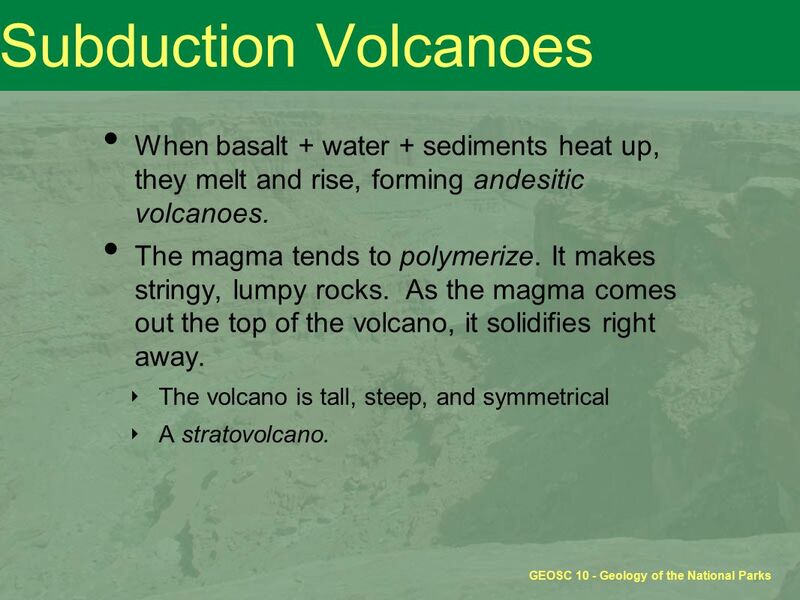 The magma tends to polymerize. It makes stringy, lumpy rocks. As the magma comes out the top of the volcano, it solidifies right away. ‣ The volcano is tall, steep, and symmetrical ‣ A stratovolcano. 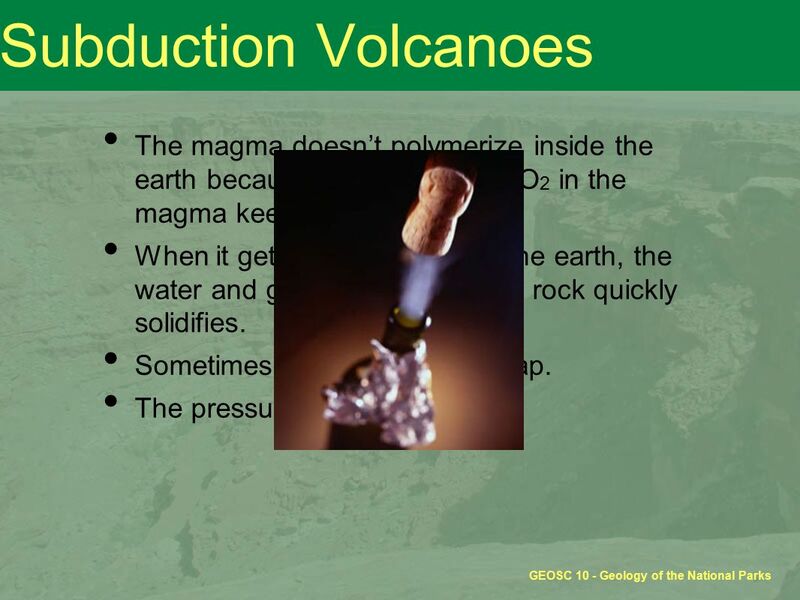 23 GEOSC 10 - Geology of the National Parks Subduction Volcanoes The magma doesn’t polymerize inside the earth because the water and CO 2 in the magma keeps the magma fluid. When it gets to the surface of the earth, the water and gas escapes and the rock quickly solidifies. Sometimes, the rock forms a cap. The pressure builds. 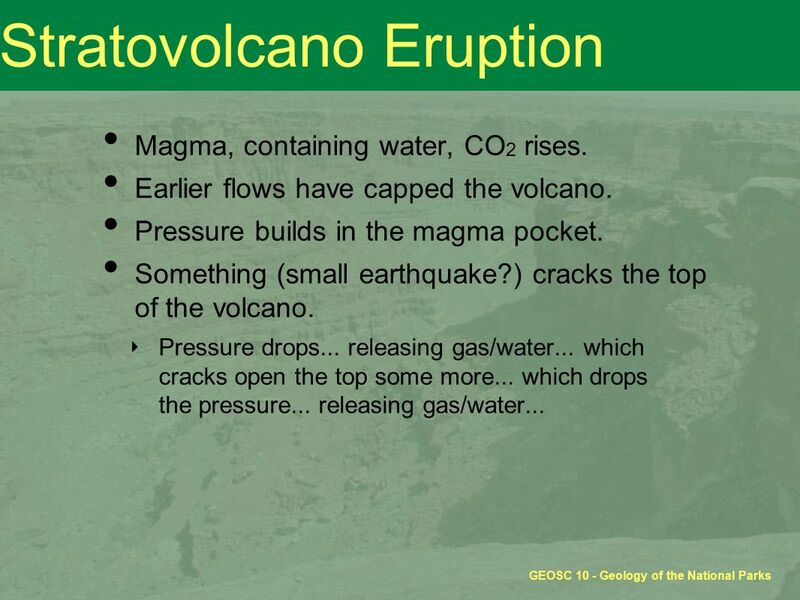 27 GEOSC 10 - Geology of the National Parks Hot Spots Sometimes a plume of magma will rise up from deep inside the asthenosphere. ‣ As deep down as core/mantle boundary? 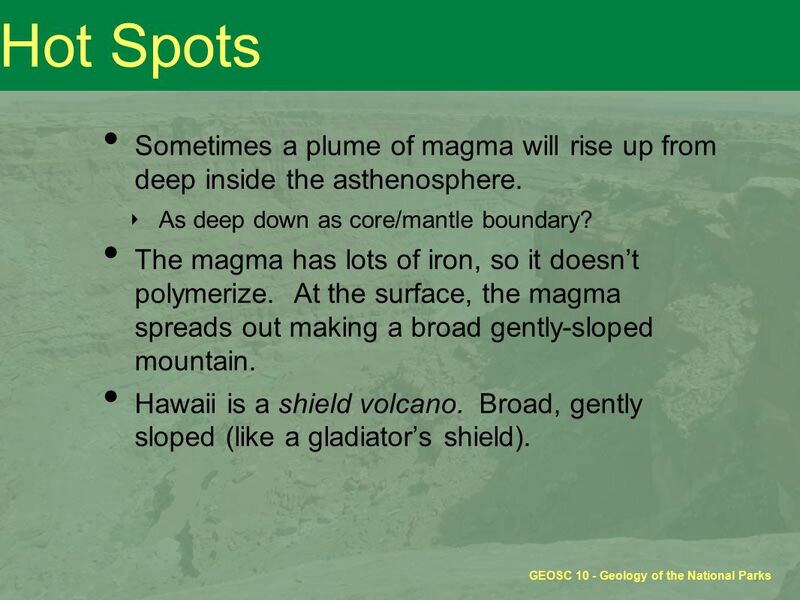 The magma has lots of iron, so it doesn’t polymerize. At the surface, the magma spreads out making a broad gently-sloped mountain. 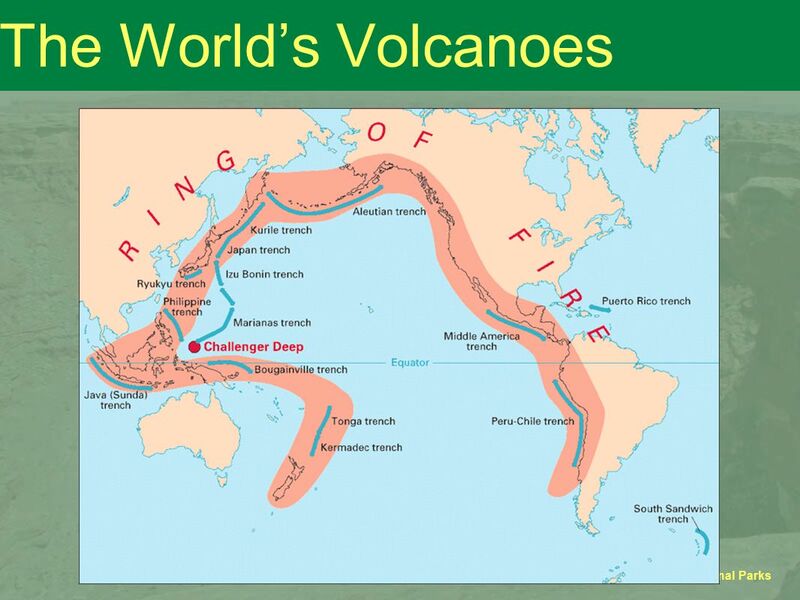 Hawaii is a shield volcano. Broad, gently sloped (like a gladiator’s shield). 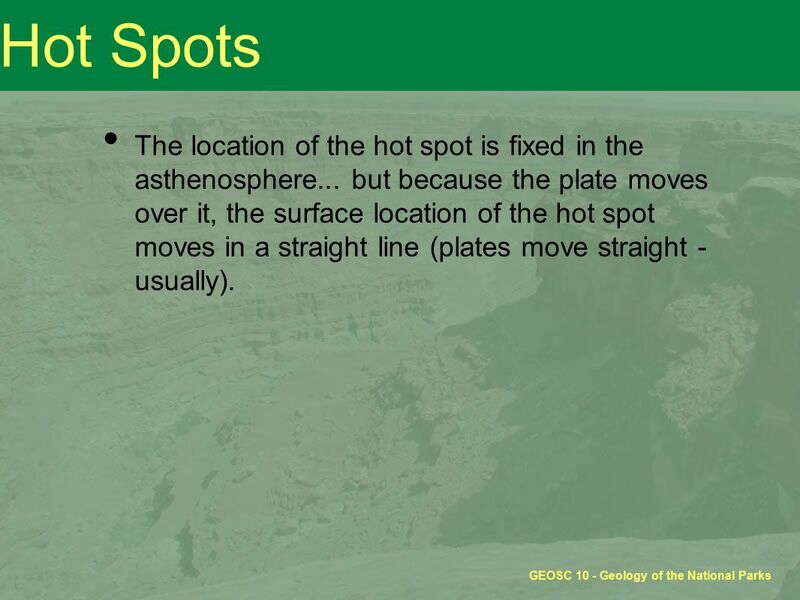 28 GEOSC 10 - Geology of the National Parks Hot Spots The location of the hot spot is fixed in the asthenosphere... but because the plate moves over it, the surface location of the hot spot moves in a straight line (plates move straight - usually). 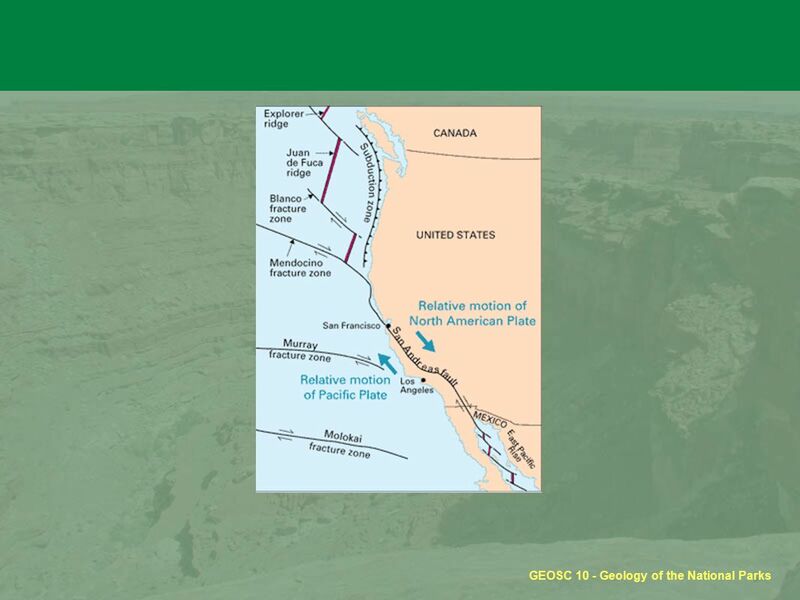 33 GEOSC 10 - Geology of the National Parks Tsunamis Move a big volume of water, and it will create a wave that travels across the ocean, eventually striking land. 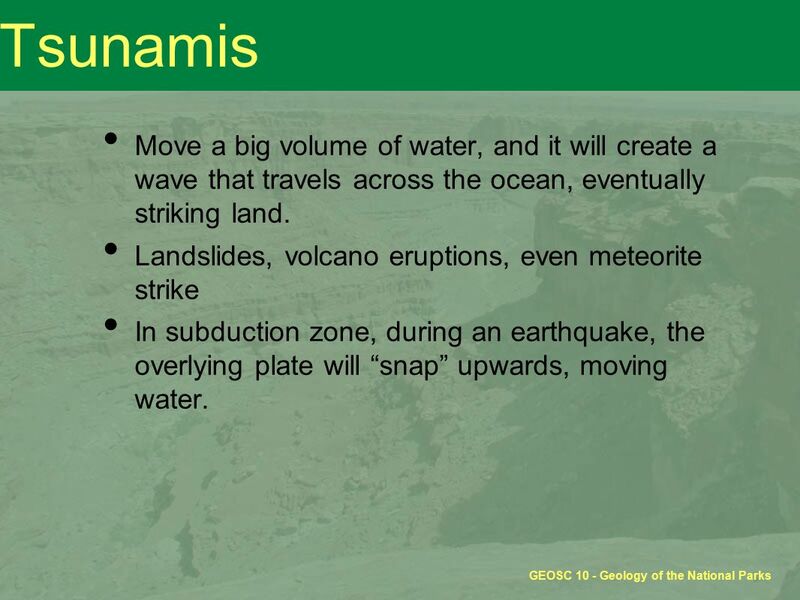 Landslides, volcano eruptions, even meteorite strike In subduction zone, during an earthquake, the overlying plate will “snap” upwards, moving water. 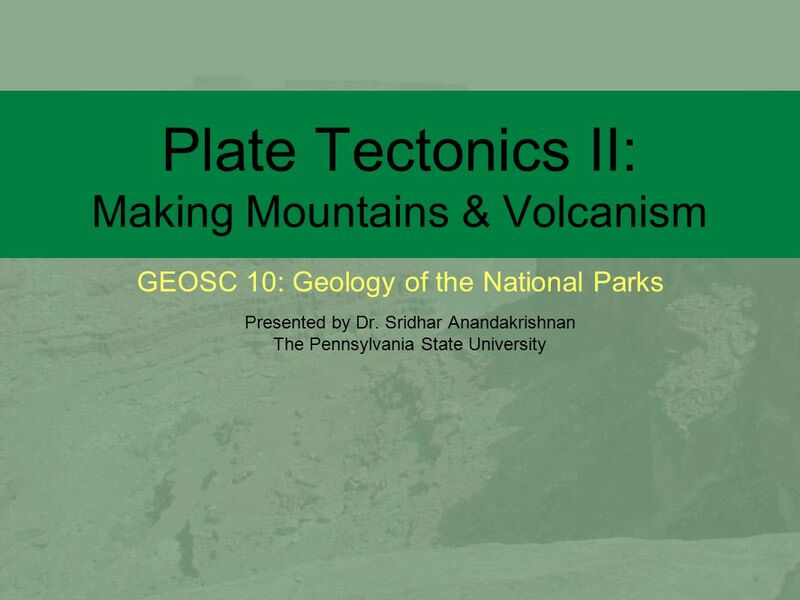 Download ppt "GEOSC 10: Geology of the National Parks Plate Tectonics II: Making Mountains & Volcanism Presented by Dr. Sridhar Anandakrishnan The Pennsylvania State." 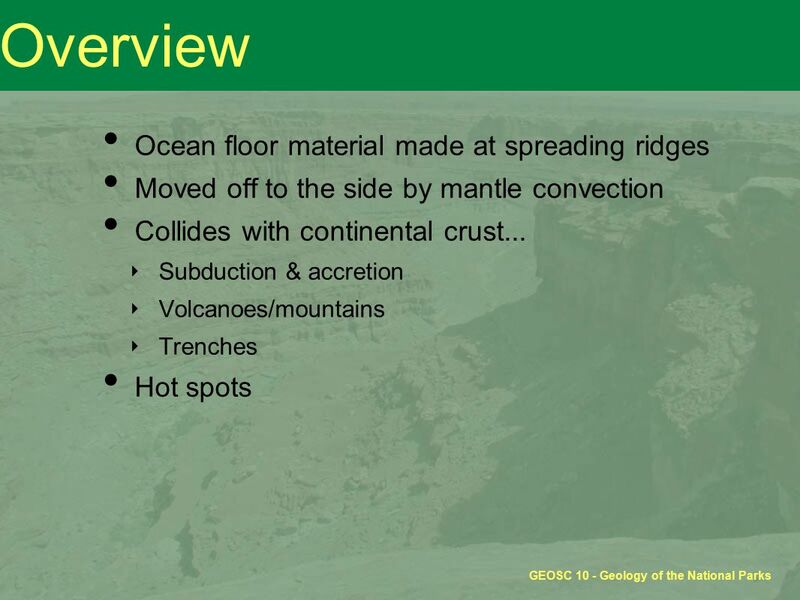 Unit 3 Geoscience 10: Geology of The National Parks Plate Tectonics II. Movers and Shakers Vocabulary Review Created By Jacob Feinland. How are these like the mantle? 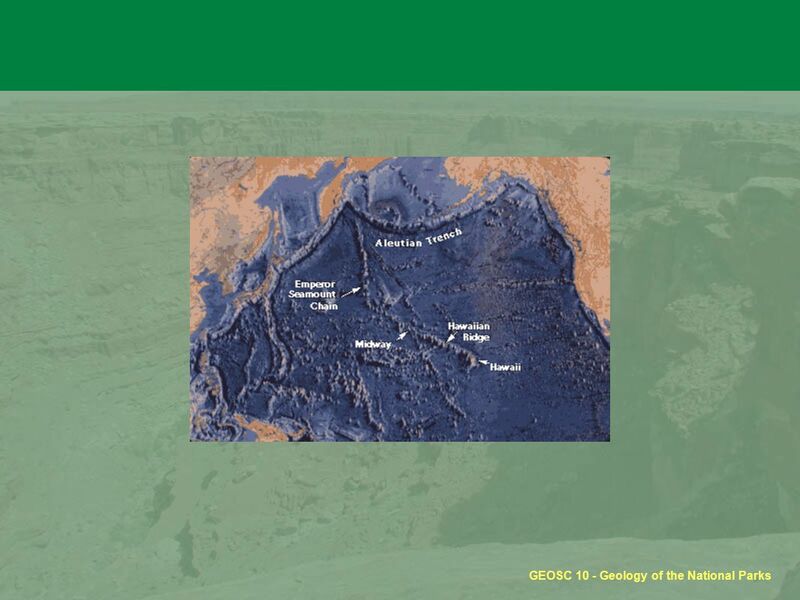 Earth Science Standards 3.a - Students know features of the ocean floor (magnetic patterns, age, and sea-floor topography) provide evidence of plate tectonics. 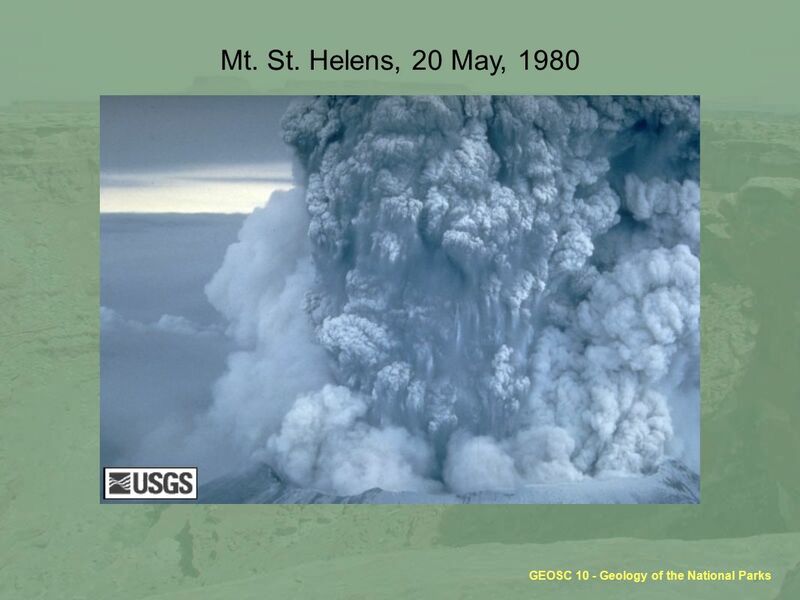 Volcanoes 11.1 What Causes Volcanoes?. 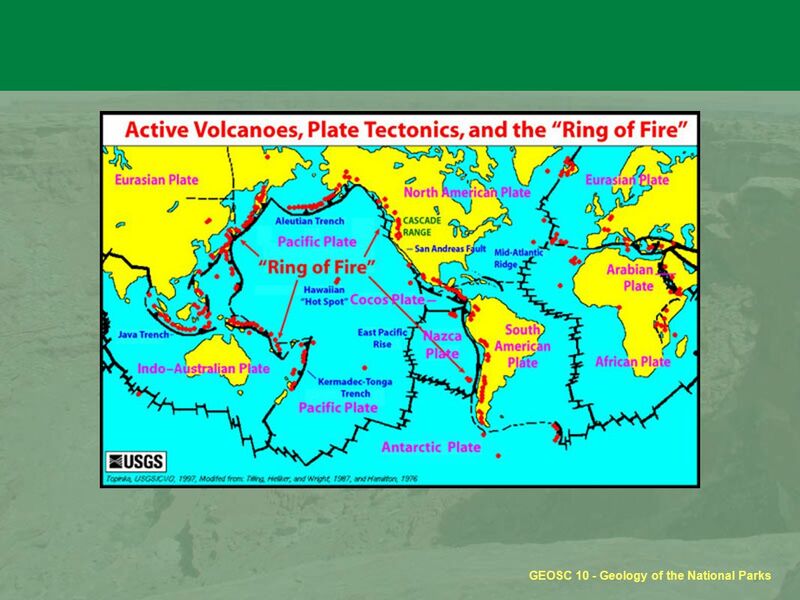 GEOSC 10: Geology of the National Parks Plate Tectonics I: Making Mountains and Earthquakes Presented by Dr. Sridhar Anandakrishnan The Pennsylvania State. 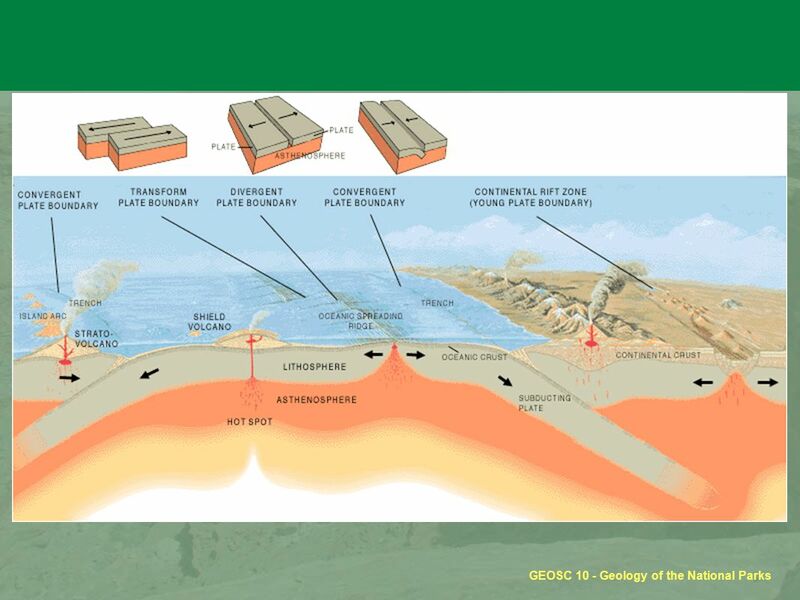 The Structure of the Earth and Plate Tectonics. Learning Goal: To analyze and describe the types of rocks that appear on Earth. 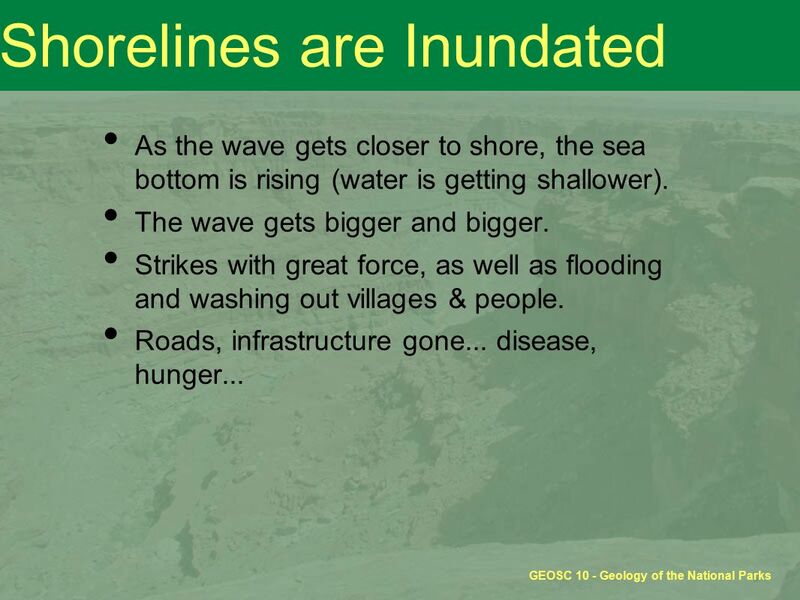 What Happens at the Plate Boundaries?. ( B) seamounts-are underwater mountains. When these have been eroded by waves and currents to have flattened tops. Why does Earth have mountains? The Structure of the Earth and Plate Tectonics. 2 Structure of the Earth The Earth is made up of 3 main layers: –Core –Mantle –Crust Inner core Outer. 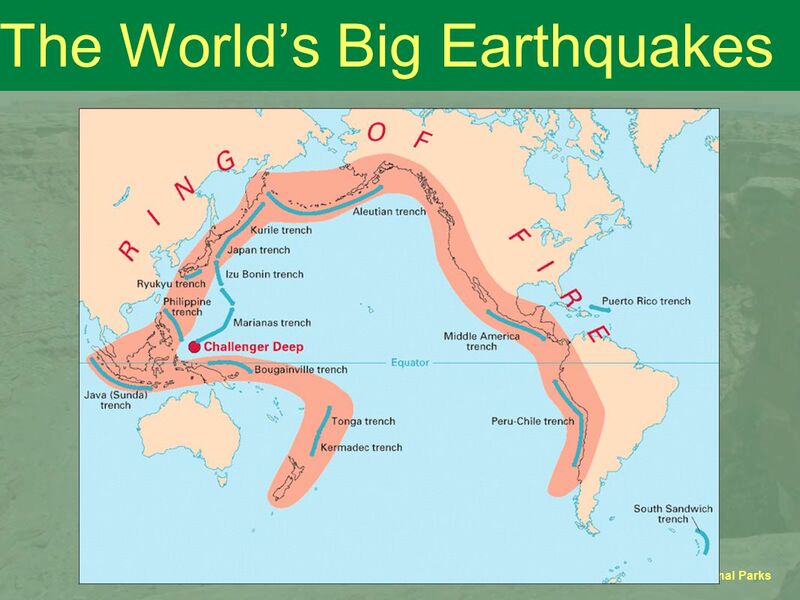 April 17 Plate Tectonics Allen. Inside the Earth Why does the earth look the way it does today? 3PYh4http:// 3PYh4. 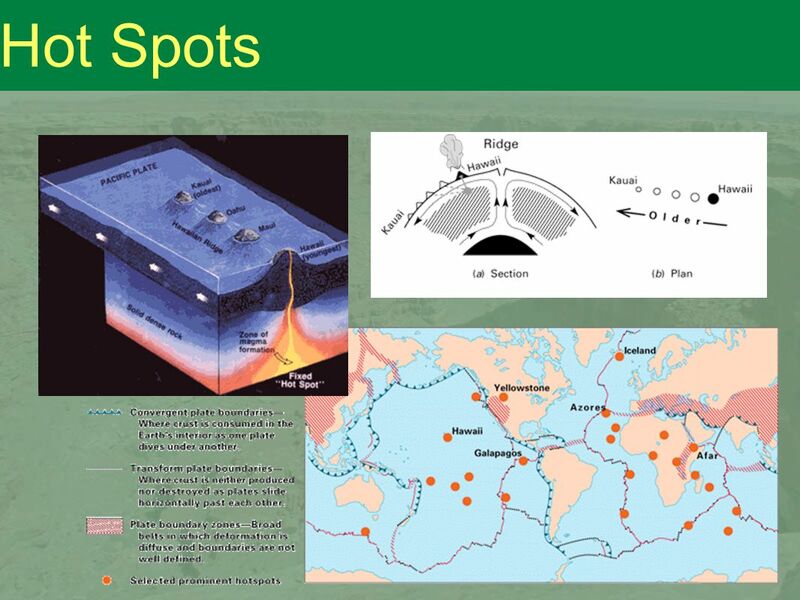 Tectonic Activity Plates. 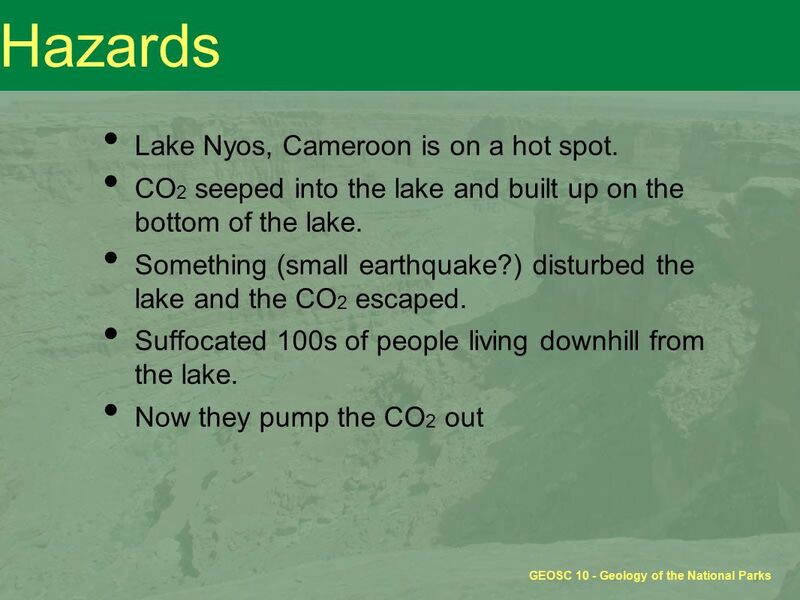 –Tectonic Plates –Convection Currents –Destructive Plate Boundaries –Constructive Plate Boundaries –Conservative Plate Boundaries.